Our Oceanfront Building in our Art Deco Deluxe 3 room: 3 bedroom Suite sleeping up to 8 persons. We are happy to offer you accommodation with “the best location” next to Lincoln Road and only a couple of blocks to Ocean Drive in South Beach Miami Art Deco district that can create nice memories for a lifetime. This is the best location on the beach right next door in between famous SKY bar & Delano designed by Philip Starck and owned by famous Ian Schregger (from NY Studio 54). Enjoy a full service upscale condo-hotel with 24h security. You also have a door man to greet and open the door for you on daily basis. There are 4 elevators, bars, restaurant, Jr Olympic size swimming pool, 2 Jacuzzis, and private beach access at your disposal. We cannot stop telling people that please remember that the real cool lounges and night clubs are on/next to Collins Ave in between 16th – 23rd street such as Delano, Sky Bar, Mynt, Vita, Set, The W, Sagamore, Raleigh, etc. Our unit is in the heart of South Beach where you can walk to just about everything without having to take a taxi. Within about 100 yards you have world famous restaurant & lounges such as: Sky Bar (on 20th Street), Mynt (on 19th Street), Baoli-Vita (on 19th Street), Setai (on 20th Street), Nobu (on 19th Street), Setai (on 20th Street), Raleigh (on 18th Street), Florida Room (on 17th Street), Rose Bar (on 17th Street), Plat Blue (on 17th Street), Blue Door Fish (on 17th Street). A few other world class places in the about 300 yards away are: Mr Chow at W (on 23rd Street), Living Room at W (on 23rd Street), The Wall (on 23rd Street), Mokai (on 23rd Street), Louis (on 23rd Street). Shelborne is a condo-hotel where all units are individually owned and some owners leave their unit in the hotel rental pool and others rent out themselves. We manage our own units to give you more value, more luxurious interiors with lots of upgrades and give you more space for your money. All guests and residents at the Shelborne have full access to all resort facilities such as pool, Jacuzzis, restaurants and bars. We are happy to offer you accommodation with “the best location” next to Lincoln Road and only a couple of blocks to Ocean Drive in South Beach Miami Art Deco district that can create nice memories for a lifetime. This is the best location on the beach right next door in between famous SKY bar & Delano designed by Philip Starck and owned by famous Ian Schregger (from NY Studio 54). Enjoy a full service upscale condo-hotel with 24h security. You also have a door man to greet and open the door for you on daily basis. There is wireless internet access, 4 elevators, bars, restaurant, jr Olympic size swimming pool, 2 jacuzzis, and private beach access at your disposal. 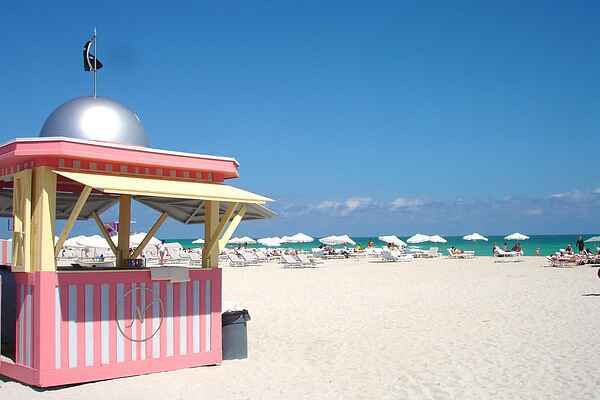 Greatest Location on the beach in the heart of South Beach. Enjoy forever views from your beachfront studio in this beautifully restored 1940's condo-hotel, situated in the heart of Miami Beach's famous South Beach Deco District. The all-new Shelborne Condominium is located directly on the ocean in the world famous South Beach. Conveniently located in Miami Beach's historic Art Deco District, the "Ocean Beach Studio" at Shelborne offers a luxurious accommodation to suit any needs. Whether you want a weekend in the tropical paradise South Beach Miami or need accommodations and an elegant Art Deco location for your business or leisure, this "Ocean Beach Condo" is ready to accommodate you. Our most popular Shelborne South Beach Oceanfront Condominium is the 3 room, 1 bath suite with 500 square feet sleeping up to 8 people (the largest suite in Shelborne). There are 2 private entrances to the bathroom that gives privacy. The Condo is located on one of the higher floors with a partial ocean view, tucked away from any night club noise of Collins Ave. Property has a beautiful Pool with direct Beach access! Kitchen Kitchen-Bar area with Fridge, Microwave, Coffeemaker, Wine Cooler and 2-burner Portable Electric stove. Bedroom #1: Consists of 1 King Size bed or 2 Twin Size bed after preference, Plasma TV with Cable TV. Bedroom #2: Consists of 1 King Size bed or 2 Twin Size bed after preference, Plasma TV with Cable TV. Bedroom #3: Consists of 1 Queen Size bed, 1 King Size bed or 2 Twin Size bed or 2 Designer Daybeds (up to 2 pers), 50 Inch HD Plasma TV, Cable TV. Bathroom: Consists of Bath tub with shower. Tile throughout bathroom.